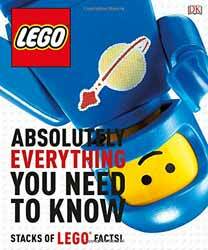 LEGO: Absolutely Everything You Need to Know is the perfect read for every LEGO fan out there. There's something here for everyone, from the youngest member of your family who loves playing with LEGO, to the older collectors who fondly remember the kits of their childhood. The design of the book makes it easy to dip in and out of. Pick it up, flick to a page and there will be lots of interesting facts at your disposal. The layout sees numerous boxes and plenty of illustrations to sink your teeth into. For example, there's a double page spread that offers information on Nice Part Use (NPU) - a term adopted by fans for using a familiar LEGO piece in an unfamiliar way. It was interesting to note that in LEGO's Big Ben kit (released in 2016) that it used minifigure tools for the clock hands and skeleton legs as railings. Every time a kit is mentioned its year of release and specific LEGO item number are also offered up. This is useful in case you see a kit you fancy adding to your collection. And just to illustrated how the LEGO universe is constantly changing and being updated... The facts for the set with the largest pieces is already out of date, as this year (2017) LEGO are releasing their biggest ever set - an even bigger LEGO Star Wars Millennium Falcon kit than 2007's 5,197 piece set. The new set will include 7,541 pieces - overtaking current record holder the Taj Mahal set which has 5,922 pieces. There's also a handy index at the back of the book to help you look up every mention of your favourite sets. For example if you're a fan of LEGO Batman, you can quickly flick to the pages that mentions these sets. Overall, this is an entertaining and informative book. Every single page is awash with interesting and fun facts which will keep everyone entertained.